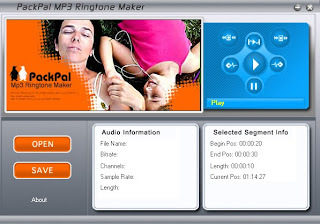 PackPal MP3 Ringtone Maker is a powerful audio cutter and super mp3 ringtone converter. With PackPal Mp3 Ringtone Maker, you can quickly make your own audio ringtones from most audio files such as MP3, WMA and WAV. And it builds audio cutter and ringtone converter in just one software. With it's easy-to-use interface, you only need several simple steps to make your favorite music into ringtone. What you need to do is play the song you want to cut, then mark the start time and the end time. You can also accurately select your favorite part, and play before you save it, to make a fantastic ringtone. with excellent output quality and high ripping speed.